This is the review that was published about 7 years ago. I dug it out of my archives and am posting it as is, with no edition or modification. I sent a copy to Lan Cao, reminding her of our families' connections. She was too young when she left Saigon to really remember us, but she mentioned us to her father who knew immediately who she was talking about. We corresponded by e-mail for a while, then she moved to teach at William and Mary College and I heard no more about her. 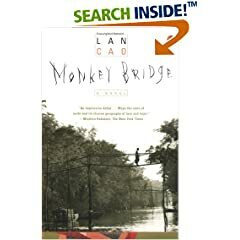 When the magazine first ran my review of Lan Cao's book, my husband had made a very nice drawing of a "monkey bridge" for me, but I can't lay my hands on it now. So we'll make do with the picture on the book cover. It is interesting to note that the Vietnamese authors and directors of books and movies about the Vietnam War (or, to us, the American War) and its aftermath have been mostly men in Europe and women here in the States - from Lê Ly Hayslip's "When Heaven and Earth Changed Places" (1989) and "Child of War, Woman of Peace" (1993), through Thi Thanh Nga's movie "From Hollywood to Hanoi" (1995), to the two books I'll be reviewing this month and next. All these works are, essentially, about reconciling the author's Western identity with her Asian cultural roots, and dealing with the sequels of war - problems I have been facing myself. I first became aware of Lan Cao's "Monkey Bridge" when I read an interview of the author in the French magazine L'Express, in its special issue on the 25th anniversary of the fall of Saigon. It was satisfying to see her saying so many things I had experienced myself, about the misconceptions Americans had about South Vietnamese people, and about how difficult it had been to adapt - and also how now she was truly an Asian American, teaching international business law in New York, totally integrated, and richer for her dual cultural experience. In that article, they referred to her book as being autobiographical, and mentioned that her father had been a paratrooper general. Intrigued, I asked around, and it turned out that, though we had lost touch for many years, our families had known each other rather well - in fact, my mother and Lan Cao's had been in French primary school together, and both our fathers had been high Government or army officials in South Vietnam. We had a lot in common. I ran out and bought the book. In South Vietnam, a "monkey bridge" is a rickety set of planks precariously suspended between two banks of a river. 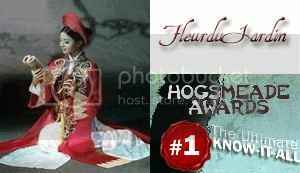 In the book, it is a metaphor for a fragile link between two cultures, and also two generations: most of the book deals with teenager Mai Nguyên's relationship with her mother. Like Lan herself, Mai came to the States in her early teens, having been sent out of harm's way, with an American friend of her family, shortly before the fall of Saigon. Then, after the collapse of the South, her mother joined her and they make their difficult adaptation to a new life, where Mai, being the one speaking the language of the country and knowledgeable about its ways, becomes the "authority" and leads her mother through the maze of strange customs and a new way of life. Several things make the situation even more difficult: Mai's mother, Thanh, becomes gravely ill; her father, Mai's grandfather, had been left behind in the awful disorganization of Saigon's last days, for which she does not seem to be able to forgive herself; and Mai wants to go away to college. The book goes back and forth between Mai's narrative, in which she reminisces about her childhood in Saigon and tells about every day's trials, tribulations and joys in this new land (particularly interesting is the bond with Vietnam veterans, American soldiers who also found readaptation difficult in a country that, at the time, rejected them), her conversations with "Uncle Michael", the American friend who got her out of Vietnam, and excerpts from Thanh's diary, mostly reflections about her relationship with her daughter, ending with a stunning revelation about her past. I have recommended this book to all my siblings because not only does this "monkey bridge" represent a bridge between cultures, and between the author and her mother's generations. It is also a bridge between the next two generations: my siblings and mine, and our children's. Ours (we are slightly older than Lan Cao) is the generation who grew up in Vietnam, both in war and short periods of peace, who was educated in Europe and knew nothing about the American education system until we sent our children there. Our children's is the generation who never knew Vietnam at all, or came over here at such an early age that they do not remember it, and is totally Americanized. As such, the book is fascinating to us, and instructive for our children. Mai's - or Lan's - is the "in-between" generation. It is interesting to see how much and how well (or not so well) she remembers things Vietnamese, the things we loved so much ourselves - the Têt (New Year) celebrations, the Mid-Autumn Festival when all the kids go out of doors carrying gaily lit many-colored lanterns in animal or flower shapes, the legends we grew up with, the "in" ice-cream parlors in downtown Saigon, the nursery rhymes and mnemonic ditties in Vietnamese or French, etc. I was amused to see how, with time and distance, and having been so young when she left, Lan got a lot of things just a little bit wrong - the worse mistakes being saying repeatedly that Vietnam is South of the Equator (the southernmost point is still about the 10th parallel North) and calling the Jade Emperor (the supreme deity of our pantheon) "the Son of Heaven", the latter being, in fact, the human Emperor, the representative of Heaven on Earth (that's like calling the Catholic God the Pope, or the Anglican God the Queen of England). Also, her style and use of tautology is a bit irritating - like "fictional reimaginings" (imagination is fiction by definition) or "aerial helicopters" (there's no such thing as a ground helicopter). The attraction of the book is in the memories and the atmosphere. The story itself is interesting, but unconvincing. Like the refugees she talks about, Lan Cao reinvents her past. Of course, she can do so because this is supposed to be a novel, not an autobiography; but it is obvious that Mai is, in a very great part, Lan herself - the way she left Vietnam before the final collapse, the American colonel she was sent with, her college interview, her adaptation to the States, her mother's illness - but Mai's background is definitely not Lan's, and the whole melodrama of Thanh's deathbed revelations on her birth and on her father's real political allegiance sound terribly artificial and unbelievable (also, in my opinion, unnecessary). All in all, despite its flaws, it is a very worthwhile book, and I do recommend it, not only to my siblings and cousins and friends, but to anyone with an immigrant's experience or wishing to understand that experience. I also recommend Lan Cao's previous book "Everything You Need to Know about Asian-American History", and look forward to her next one, which she tells me has just been submitted to the publisher. In the case of Mai Elliott, I didn't have any prior connection with her, but we had more in common than I had with Lan Cao. We are closer in age, and we both married American men, plus other similarities I mention in the review below. Here too, I wrote her and sent her a copy of my review, we discussed this and that for a while, then the relationship just petered out due to distance and differences in concerns. As its title indicates, this book is the biography of four generations of the author's family, the Duongs, from the mid-1800's to the present day, over the background of the momentous historical events of the last 150 years. Since this was an extremely large family (Mai's great-grandfather and grandfather had several wives, each of whom provided them with about a dozen children; her own parents had 17 children), there seems to have been a Duong present at almost every scene of historical significance, on every side of every conflict, the French, then the American Wars (both of which people tend to forget were also civil wars), the Second World War, the Japanese occupation, the fall of Saigon: Imperial Court, French administrative offices, Governor's palace, Vietminh then Vietcong's jungle strongholds, small villages during French "cleaning-up" operations, then during Communist land reforms, Hanoi during the 1945 street battles, Saigon in the last days and after "liberation", and the States, where Mai attended university and now lives. With Mai Elliott also I have a lot in common, some elements we share with Lan Cao (whose "Monkey Bridge" I reviewed last month), some not: we are the product of three cultures, Vietnamese, French and American; we grew up in wartime; our fathers were among the rare non-corruptible high officials in Vietnam; Mai and I deliberately escaped the stifling Vietnamese high-class society and possibly an arranged marriage by going abroad to study; we both married American men; and, like most Vietnamese, all three of us had friends and relatives on both sides of the war. The difference between us is that Lan and I are products of the South, whereas Mai's family came from the North. I am not talking "North" and "South" in political terms, though the North/South division dates back to the seventeenth century, when two noble families, the Nguyêns and the Trinhs, fought it out for 200 years. Traditionally, Vietnam has three Regions, symbolized by the three stripes on the old Vietnamese flag: Bac-Ky (North), Trung-Ky (Center), and Nam-Ky (South). Though being one people with one language (but different accents), the inhabitants of the three regions are very distinctive in personality and outlook, and there has always been deep antagonism between North and South (the Center usually remaining neutral), with a lot of prejudices and preconceived ideas. Broadly, in the South, with its vast, rich agricultural land and warmer climate, life is easy, people are easy-going, light-hearted, laugh a lot, and see their northern brethren as dour, stingy and humorless, whereas Northerners see Southerners as lazy and frivolous. In the North, the Duongs were a very influential family and were in the thick of things, from the Imperial period, early days of French colonization and first nationalist uprisings, to the partition of the country in 1956. Her account of that early period is well-documented and enthralling, specially as, with her father a high official, her uncles big landowners, one sister joining the Communist guerrillas, her brothers involved in the anticolonial street fightings in Hanoi, she was able to follow every aspect of the evolution of Vietnam. Then, in 1956, along with about one million of their fellow Northerners, mostly Catholics, the Confucian/Buddhist Duongs fled Communism to the South (the communist sister and her family stayed North), where her father eventually found a position in government, but nowhere near the prominence they once enjoyed. Her account of the marking events of that period - the overthrow of the Emperor, the Ngô Dinh Diêm period, the arrival of the first American soldiers, the coup against the Ngôs, the Buddhist protests by fire, up to the fall of Saigon - is told from a general public view, not, as before, from the vantage point of someone in the inner circle. In 1961 Mai got a scholarship and attended Georgetown, where she met David Elliott. She came back to Vietnam, David joined her and they got married. They lived in Vietnam for a while: Mai worked for the Rand Corporation interviewing Vietcong prisoners of war or defectors. Then they went back to the States and were there when, in April 1975, Saigon fell. Part of Mai's family managed to get to the States, some were trapped and ended up going through "re-education camps". Mai recounts everybody's experience, including that of her sister who had stayed North, then came South with the victorious Communists. In 1993, she went back to Vietnam herself to see her relatives and gather documentation for her book, which ends with her plane taking off from Hanoi in the sound of the monsoon rain instead of gunfire. The North had won the war and lost the peace, but there was peace at last in Vietnam. This sprawling saga makes fascinating reading, and underlines the fact that the "Vietnam Wars" (the French's and the Americans') were, above all, Vietnamese tragedies. However, as another critic pointed out, though her ambition is to parallel the history of the whole country, Mai's account is limited to the upper-middle-class, with very little - specially after she got South - on the farmers, urban workers, fighting soldiers or intelligentsia. The history was comprehensive as long as she was in the North. Once the Duongs got South, they pretty much kept to themselves, mostly socializing with other Northern refugees, sending their children to private schools, not trying to mix. Being out of the decision-making loop, they were pretty much ignorant of the whys and wherefores of crucial decisions. So I find her account very biased, with some sweeping stereotypes like "Southern landowners were absentee landlords living it up in Saigon". My own grandparents (and Lan's) were landowners who stayed on their lands until dispossessed. Another sweeping generalization: the poor quality of the South Vietnamese soldiers and the contempt in which, supposedly, their American allies held them. Would Tiger Woods' father have named him after a South Vietnamese Ranger if he didn't think highly of the latter? None of Mai's numerous relatives were in the armed forces, whereas several of mine and Lan's were. Moreover, had Mai not concentrated so exclusively on studying the Vietcongs and trying to understand them, she might have learned what the South Vietnamese common people were like and why they stuck to the end with a "corrupt" and "tyrannical" government (as if a communist regime was the height of liberalism). Her extensive bibliography covers almost exclusively North Vietnamese and American books, mostly by liberal writers who, unlike their European counterparts, never wanted to admit that in Vietnam they had supported the kind of regime they had opposed in Hungary and Czechoslovakia (Funny how, about Vietnam, communist writers supported communism, but liberal writers and media didn't support democracy). She seems unaware of the heroic resistance that sprang up after the fall of Saigon, including the fact that in 1986, a group of South Vietnamese, who had flown back from France some years before to join in the fight were caught, convicted at a public trial in the best Stalinian tradition, and executed. It was front-page news in all European papers, no mention of it whatsoever in this book. Still, despite this bias, and a style a bit too formal and dense, I recommend the book, for it presents facts and insights I don't think most Americans have come across before. This is very interesting -- both of them. Thanks! The fiction that I write is also "ethnic" fiction, but of course, not from the immigrant perspective. Ha. With the first, you bring up an interesting point and something that I think many writers struggle with -- how much of yourself goes into a story? How much of the people you know? In fanfic, I've had several folks remark on the OCs, or "original characters" that sometimes make their way into my stories. The remark is usually on how "real" they seem, but I think that's more a reflection on a common problem with beginning writers, whether they write fanfic or original fiction -- the challenge of creating (original) characters. What often happens is the idolization of characters, or villainizing, and stereotypes (and "Mary Sues") tend to abound, as a result. They're charicatures, not characters. The best character writers I know base those characters on people they know, and on themselves, but none are auto/biographical. They mix and match. The characters are more interesting because, based on real people, they're quirky and complex, like real people too. BUT that brings us back to the problem when the author creates a protag who's heavily based on herself/himself, and/or sits a book in a place and time one lived in one's self. How far do you dare to go? It's the ultimate "write what you know" but it treads the edge of violating the privacy of others. But in reinventing, it can be so very tempting to airbrush things, making them better. Or making them worse. Am I exaggerating? And if so, do I need to, for the sake of the story? Or am I doing so because being completely honest is getting scary? And if so, why? Anyway, the question popped to mind as I was reading the reviews. I'm intrigued by the first book in particular, that straddling generation. Lan Cao's General Cao Van Viên's daughter, isn't she? Her father was the Chairman of the Joint Chiefs of Staff of the ARVN. Her Vietnamese name, in the right order of surname-name, is Cao Phuong-Lan or something like that. Sociologically speaking, the generational thing is more pronounced in immigrant populations than in people who stayed in their own countries. From still-traditional Vietnam to XXth century USA is a leap of more than one generation, the parents find themselves in an environment not one but several generations from them, different language, different culture, different customs. They're appalled at the dating system among the young, they find some body language offensive to them when it's normal behavior here, they balk at being called by their first names by people who could be their kids or grandkids. Adaptation is difficult. The second generation wants to belong in the new environment and reject the old ways. Very difficult situation, I still see it around me (there's a significant VN community in Texas) every day, even now that 32 years have passed since the Fall of Saigon. I was surprised at the number of "second-generationers" in this site and another VN site I go to. At that other site, they chat almost exclusively in Vietnamese, I was taken aback at the number of youngsters who participated. This AV site is a lot more "second-generational", English is used about 90 percent of the time, with some old-timers putting in a sentence in French here and there, and Vietnamese used very rarely. Even so, the fact that these "kids" join a Vietnamese site at all is remarkable. Posted: Sat Oct 06, 2007 10:51 pm Post subject: Autobiography or fiction? With the first, you bring up an interesting point and something that I think many writers struggle with -- how much of yourself goes into a story? How much of the people you know? I think that a lot of writers base their works books on their own experience, or part thereof. It's what you say, write about things (and people) you know. That's why someone's first book (the first written, not necessarily the first published) is to him or her the most important, and for others the most revealing. It's usually what the person most wants to write about. I know, for example, that some of George R.R. Martin's novellas (including the one that won him a Hugo) and novels are based on his own experiences with the women in his life, especially his first wife. That's the romantic side of him, the one I like. I like the side fascinated with horror a lot less. The character(s) that are thus created are, like you say, a mix and match. I know that the heroine of my short story "Colors" is based partly (only partly, though) on myself, and the surroundings (the mountains, the hill tribes, the family estate) are where I grew up and have my best childhood memories. In her book, Lan Cao also takes a lot of background details from her own past, her own experiences. A lot of the events taking place in the book have parallels in her life. Since my family knew hers well, I was able to determine what was based on reality, and what had been added, modified or prettified (or on the contrary painted in darker tones). And yes, the generational question is a very important and interesting one. Like Janine, I see it around me every day. How the older generation is trying to cling to the old ways, but with kids growing up in the US or France, it's quite a challenge. Some manage it, some don't. Family gatherings are very illustrative of this generation gap, with the older people speaking their native language, and the kids playing together in English or French. The hold of tradition may endure for one generation (the kids taught to always obey their parents, to marry where they're told to - though of course some don't) but it will never survive the third generation, who will be entirely westernized. It's after that, the next generation, who will want to "rediscover their roots", re-learn the language and the culture, visiting the old country as more than tourists. All the above are written by Vietnamese-Americans about the Vietnamese experience in the last days of the Republic of Vietnam, the life under Communism, or about the next generation's experience - the children of the Vietnamese Diaspora's experience. which is a fictional story about someone who cooked for Alice B. Toklas. It's supposed to be very well written and got good reviews. There's also a book about Francophone influence on Vietnamese literature, I forget the name of the author. Kitty and Annamite en France, do you know, and can you recommend some French-Vietnamese contemporary writers? There must be quite a lot. But I have the impression the Vietnamese community in France is a lot more integrated than it is in the United States, what is your opinion? Graham Greene is neither Vietnamese nor American, but this is the story of an American in Vietnam, so it kind of belongs here. This article too was published in the magazine I was writing for at the time. All propagated with the best intentions". Both book and movie can be viewed and enjoyed at face value as the story of a love triangle set against the background of political turmoil and unrest in the Viet Nam of 1952. Or the characters can be seen as the embodiment and symbols of their own countries, politics and backgrounds. Fowler (Michael Caine) is an ageing British journalist half-heartedly covering the war between the Viet-Minh and the French colonial troops, having found in Viet Nam a lifestyle that suits him and a beautiful Vietnamese mistress, Phu*o*.ng (Do thi Hai Yên), with whom newly-arrived Pyle (Brendon Fraser), a young, naïve, idealistic American, promptly falls madly in love with. Pyle has the advantage of being able to marry her and give her a respectable life, whereas Fowler’s wife will not grant him a divorce. Despite that, Phuong sticks with Fowler until he is caught in a desperate lie to keep her, then she leaves him for Pyle. When Fowler discovers that Pyle is not really an economic attaché but an intelligence agent trying to bring democracy – as he sees it – to Viet Nam, and not being too scrupulous about the means of achieving what he sees as a noble goal, he is caught in a moral quandary. Pyle is unwittingly doing a lot of harm, but if Fowler stops him, is he doing it for the sake of the Vietnamese people, or to get his lover back? In one meaningful scene, the American screams at the Brit about his Vietnamese girlfriend, "Look at Phuong, the daughter of a professor, no money, working as a taxi dancer, the mistress to an old European man. That sums up the whole country, doesn't it?". The ironic thing is, as the American sees through the symbolism that Phuong's life is of the country of Vietnam, he never realizes that his own life is the symbol for the new, strong America who's about to get involved everywhere and get into trouble for it, or that the Brit's life is the symbol for the old, tired Europe, clinging on to the remnants of its imperial days and having periodic pangs of remorse over the things they've done, but feeling a genuine love for the country and its people – though that love is a bit patronizing at times. One moment I found very significant is the first time we see Phuong wearing a Western dress instead of an a’o dài. The book, and movie, are mainly about the two men and their diverging views of the future of the Third World. They were written and made by Westerners. The female character is only there for decoration and background, she doesn’t have all that much to do or say, and in the book she’s practically an airhead, “wonderfully ignorant” as Fowler puts it at one point. The other Asian character, Fowler’s Vietnamese assistant (Tzi Ma) in the movie, an ethnic Chinese merchant in the book, is the only one who has the real interests of the region and its people at heart, but his is a very minor role. The blustering warlord (Quang Hai) that Pyle would like to make into the “Third Force” leader of an independent Viet Nam is a two-dimensional character who presents not much interest. The difference between Pyle and Fowler is that one sees abstract ideas and ideals, and the other sees the reality of the effect of those ideas on flesh-and-blood people. In the pivotal scene that decides Fowler’s course of action, we see the aftermath of a terrorist bombing in front of the Hotel Continental. Fowler, appalled, runs around trying to help people and is deeply moved by the death and suffering. Pyle sees the carnage as a means to his ends, callously brushes off splattered blood from his trousers legs and shoes, takes reporters around to point out the most spectacular shots of “victims of Communist terrorism” and assuages his conscience by saying “After all, one can say that these people died for Democracy” – a phrase to be echoed decades later by “We had to destroy the village to save it” [or in the past, when Crusaders and missionaries conquered or killed people to save their souls]. Pyle’s intentions are good, and bringing democracy to a people emerging from colonialism, in other words doing what’s best for them whether they realize or want it or not, is what’s important. No matter that, given the choice, the people he wants to “save” would not necessarily cry out “Give me liberty or give me death!” but would prefer going on quietly with their business and their lives. That pretty much sums up the character and a certain American attitude towards the world that he symbolizes. Full of good intentions, with noble ideals to realize, to attain freedom, liberty and pursuit of happiness for all – but with only the foggiest idea of how the implementation of their grandiose plans will affect the countries and the peoples they genuinely want to help, and an imperfect knowledge of the forces at work in those countries and in the world. The release of the movie - which is very faithful to the book - had to be postponed in the wake of 9/11 but it is very timely now, for the parallel can be made between the American intervention in Viet Nam and the impending war in Iraq. The book, that some have called “prophetic”, is thought-provoking, the movie is an excellent adaptation. The setting is authentic, complete with Saigon remade to look like it did in the 50’s, street noises, background music, buildings, cars, etc. The acting is good to excellent. In Michael Caine, we definitely have an Oscar contender. Do thi Hai Yen is very pretty and acts very well the few times she is actually called upon to act. Brendon Fraser suitably comes across as naïve and blissfully unaware of the human toll his good intentions exact. Tzi Ma is very effective in his small role. I heartily recommend both [the book and the movie]. I'll write a review of the 1958 version in a later post. I don't think I actually ever wrote a review of the 1958 movie version, but the story was modified to adapt to the prevalent political views of the time. Of course the role of Phuong was played by Georgia Moll, who's about as Vietnamese, or as Asian, as I'm blonde! The book's message was totally lost in the 1958 version. The 2002 version was much more faithful, and the message potent, and still very much relevant today. Your reviews are excellent, Wildflower. Sociologically speaking, the generational thing is more pronounced in immigrant populations than in people who stayed in their own countries. From still-traditional Vietnam to XXth century USA is a leap of more than one generation, the parents find themselves in an environment not one but several generations from them, different language, different culture, different customs. They're appalled at the dating system among the young, they find some body language offensive to them when it's normal behavior here, they balk at being called by their first names by people who could be their kids or grandkids. Adaptation is difficult. The second generation wants to belong in the new environment and reject the old ways. Very difficult situation, I still see it around me (there's a significant VN community in Texas) every day, even now that 37 years have passed since the Fall of Saigon. Yeah, I'm surprised that those kids join these sites, too! Haha, "those kids"! This is funny coming from the youngest member of the site! It was not so long ago that you, Little One, was demanding lì xì from all the rest of us at Tết, remember? But I come in here so rarely nowadays. Maybe you're not the youngest member now? Ah, time does go by, doesn't it, Little One? And you're definitely not a kid any more.